Often there is a need to deploy multiple Avi Controller cluster instances starting from some common initial single Controller configuration that differs from the factory-default settings. This can be achieved by creating a JSON file with the required object definitions and then using it during deployment of subsequent Controllers, which, as leaders, can then add followers to become clusters. At the end of the process, the result is a set of identically initialized Controller clusters, ready to be individualized as needed. In most cases, these objects can be created by referring to the Avi REST API Guide. /opt/avi/scripts/avi_passwd_tool.py --password admin --salt fF6ngAb3pvPgpbkdf2_sha256$100000$fF6ngAb3pvPg$ijkEue1M9fR/qsLVgzvPe7N0VvOxIjDiJVmK9NIx+0Q=$6$fF6ngAb3pvPg$CqAKtNRZtgXtJchrPmoxUgdLFM7rFGmta1tWb7sobQI4iSZAY2QuAOBNtboVGrmDYPMCvqXXH6lARr9RedCJT. As a best practice, it is recommended to take a configuration backup before deploying the Controller using setup.json file created by the Python script. The following command will take an encrypted backup of the existing configuration. Wait until Controller comes up. Place the config file on the Controller as /var/lib/avi/etc/setup.json (note the filename). Upon reboot/fresh-start, the Avi Controller will self-configure using the provided setup.json file. If setup.json size is bigger then than the allowable limit, setup.json can be uploaded and referred in the deployment phase. If setup.json size is bigger then than the allowable limit, cut-paste the my-avi-config-url.json into the user-data section during launch from AWS Web Console. Private via RBAC on VM: use the ‘s3’ style. The VM role should have s3:GetObject action allowed for it to be able to s3-get the object using IAM. Private via RBAC on S3-bucket: use the ‘s3’ style. The VM role should have AWS access. The S3 bucket should have permissions for the account or user or VM role to download the object. If the Avi Controller is deployed using Azure CLI, the JSON file can be provided during the deployment. 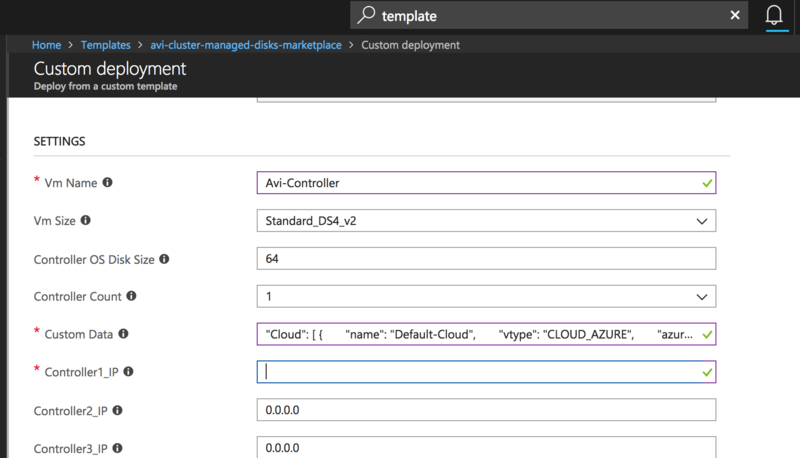 If the Avi Controller is deployed using ARM template,the JSON data is provided as the Custom Data on the Custom deployment page of the Azure portal. Navigate to Home>Templates>avi-cluster-managed-disks-market place>Custom deployment. Use the required JSON template for the Custom Data field. For reference, the below JSON template is for adding 8.8.8.8 to DNS configuration. Copy the JSON configuration mentioned above, and add it to the Custom Data field in ARM template mentioned in the previous screenshot.